In the “The Lab” we present the latest products and put them through their paces for you. Some undergo long-term tests, while we check others out only briefly. This time we reveal how the Race Face Rip Strip fared. We now have a million and one clever designs to take tools out of our bag and get them onto our bodies and bikes. We have tools inside the steerer tube, straps to hold on inner tubes and we can even fit a tool set inside the main axle of our cranks. UK tester Trev has a pathological hatred of backpacks, so anything that helps avoid the swinging monkey on his back gets him stoked – so he was the first to get his hands on the Race Face Rip Strip. 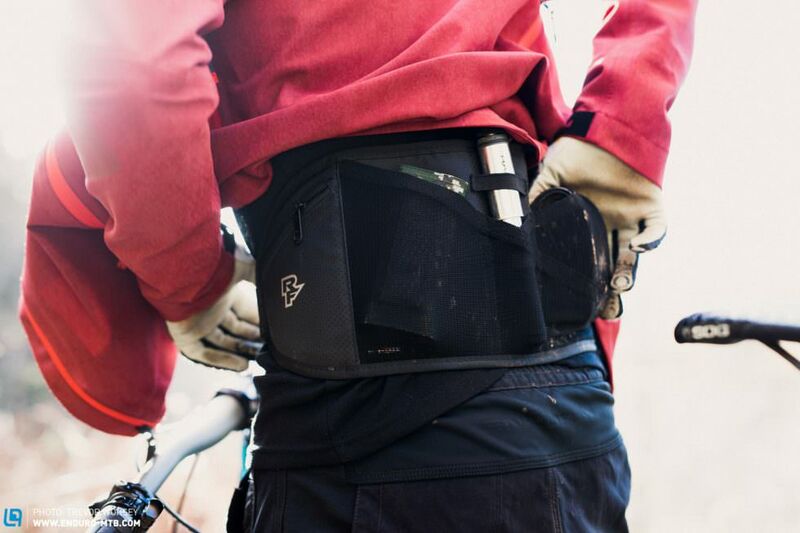 The Rip Strip works a bit differently to most ‘bum bag’ style belts, with a wide and flat lumbar support. This means that when tightened up, the belt sits tight against your back with no swinging or wobbling at all – a great improvement over most of the products on the market. We do not like that the only place to store a pump is directly against spine – a potentially dangerous situation should you go over-the-bars. 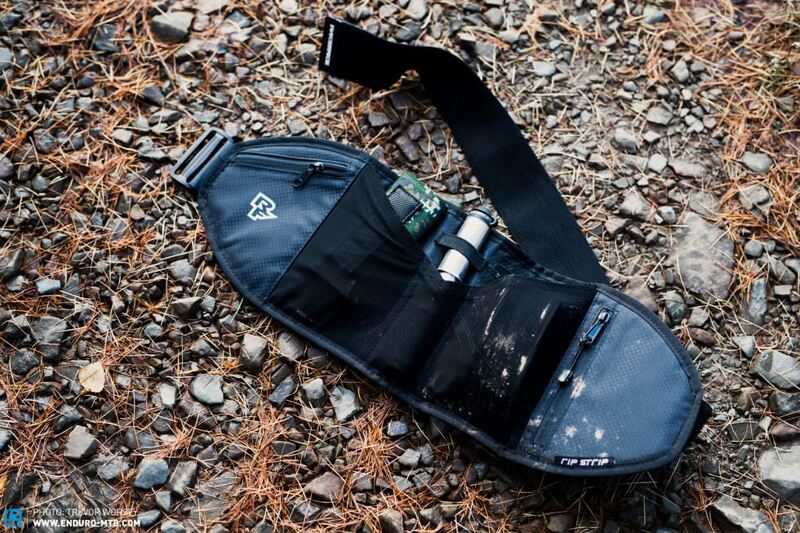 If you choose to carry CO2 instead, the Rip Strip is a great way to minimise your backpack. Initial excitement about the perfect support and fit soon turned to disappointment when Trev loaded a pump, tube, multitool and some trail snacks into the bag. 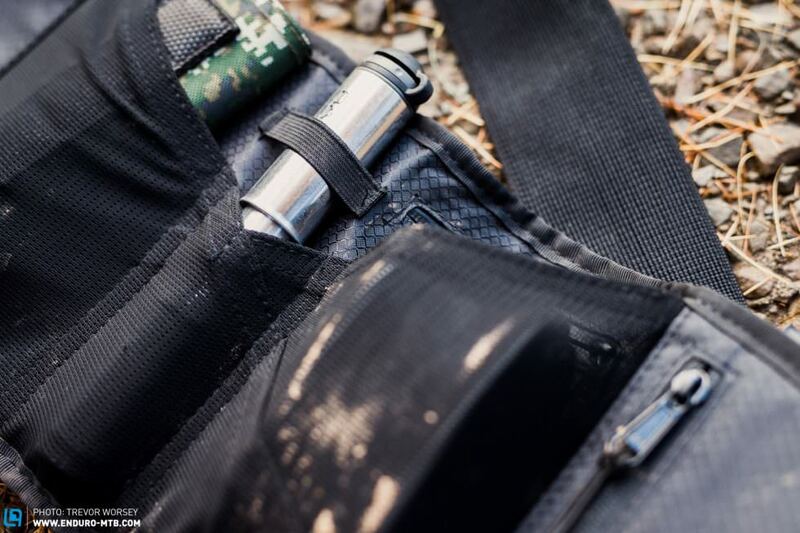 He loves the elasticated and reinforced pockets that allow you to carry a water bottle(s) and a spare tube and snacks, and zippered pockets are a nice touch. However they are too small for some smartphones – especially if you have a case fitted. The fundamental error is that the only place to secure a pump is in the central pocket with an elastic loop to keep it secure. A nice idea, but it means that the pump sits directly inline with your spine, which is super uncomfortable and a total no-no when it comes to safety in a crash. Why Race Face didn’t choose to offset the pump is confusing, as there are many locations that would have worked better on the Rip Strip. The build quality wasn’t the best either and the stitching soon showed some loose threads. These serious omissions aside, the lumbar design is certainly the most stable, minimalist bag you can buy. Like a hollywood sequel, with the Race Face Rip Strip the hype and initial teasers were exciting, but with some fundamental design errors we were ultimately left disappointed as it could have been better.